Shania Twain, Jennifer Lopez, Britney Spears, Mariah Carey, Boyz II Men, Guns N' Roses, and other non-DJs have signed up in the last few years for residency performances in Vegas. 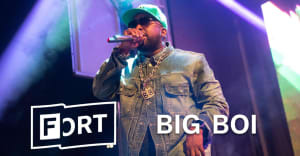 Big Boi announces that he will set up shop at Wynn Las Vegas on February 6, March 12, April 16, June 22, August 20, October 1, November 12, and December 10 for a DJ residency. He stands out in a lineup that mostly features big-tent electronic music titans like Alesso, Avicii, and David Guetta. In addition, Big Boi will play some dates with his Phantogram collaboration Big Grams. Check those out below. Correction (2/3 5:10 p.m.): A previous version of this post misstated the nature of Big Boi's performance in Vegas. This post has now been corrected.